Years ago, Morton Blackwell, president of the Leadership Institute and one of the founders of the conservative movement, wrote an essay called “The Real Nature of Politics” in which he shared the strategy he and Paul Weyrich devised after the defeat of Barry Goldwater. Blackwell and Weyrich, co-founder of the Heritage Foundation, wanted to learn how to win elections. Blackwell came up with several principles, two of which I think are vitally important for today’s conservatives to understand as we move to the next phase of political activism. We can have the most noble causes, have the truth on our side, and be absolutely right on the issues and still lose, every time. Those of us who have observed the political scene for many years know this very well and sadly, have seen it time and time again. If we really believe we are right, that our principles are true and our causes are noble, it’s not acceptable to throw up our hands and hope everything works out. Neither can we continue to use the same losing strategies that, although they prove we’re right or demonstrate our commitment, accomplish no substantive shift in the laws or in our elected officials. When we look around us at the opponents of our causes, our missions, our goals — even of liberty itself — it’s often a natural reaction to think about “those people” as our enemies. When we get into the brinkmanship of public policy, it’s sometimes easy to dehumanize those who oppose us and treat them disrespectfully and without the dignity they deserve as human beings — as God’s image-bearers. I’ve watched in recent weeks as conservatives who oppose Common Core have viciously attacked certain legislators — conservative Republicans — who don’t support repeal efforts to the extent many believe is required to demonstrate loyalty to the cause. Many also attacked someone in Speaker Batchelder’s office who (in the eyes of some) has been the one standing in the way of efforts to repeal Common Core. Many of the people attacking this person — I’ll leave her name out of it — don’t know that since her days on the State Board of Education she has been an advocate for homeschoolers and one of the state’s strongest supporters of school choice in all forms. I’ve known her to be a thoughtful, intelligent person who really does desire the highest standards for Ohio’s children. We may have genuine — and emotionally-charged — disagreements about how to achieve the best result in debates about important issues. And it’s fair game to have those debates, but it’s wrong to caricature our opponents as some sort of evil child-haters because we disagree on policy. When we demonize our opponents, we burn bridges and often forfeit opportunities to work together in the future, with both Republicans and Democrats who may share our values on certain issues. I’m not at all saying that we should not have intense debates or that we should stand down when we face opposition. Let’s have those debates but let’s do it it in a respectful, professional manner worthy of our causes. This is related to #1, except that it goes a step further. Not only do we have to refrain from burning bridges; we must build them. Here’s an example: Earlier this year, my state senator, Sen. Frank LaRose, sponsored a so-called “anti-discrimination” bill that many believe would severely infringe on religious liberties. There was an immediate backlash from conservative Wayne County (which LaRose inherited in redistricting), including from many on the county Executive Committee. I’m not privy to what he was thinking, but I suspect that he was surprised by the strong objections to his bill and stung by the criticism. Wayne County represents a large chunk of his district and it’s a very different culture than Summit County, where he lives and where he was originally elected. Many of us suggested that he needed to spend more time in our county so that he could better understand the people he now represents. To his credit, LaRose did just that. He showed up at every parade, picnic, meeting, corn festival, and hog show in the county this summer. Some of the early events were awkward and it probably took a fair amount of courage for LaRose to show up and face his unhappy constituents and party leaders. To date, though he has not removed his name as a sponsor of the bill, LaRose has not pushed for its passage. In the meantime, the lines of communication are open and everyone is on speaking terms. That will be important going forward as we anticipate working through issues together in the future. I would say that’s an understatement. At the fundraiser, I asked Borges what he, as our party chairman, intended to do to try to bring disenfranchised conservatives back into the Republican fold. He cited Gov. Kasich’s record and pointed to the great harm Democrats would do in the state. When I asked, he denied that he was telling conservatives to vote for the “lesser of two evils,” saying that if that’s the message we are hearing from party leaders, they need to learn to communicate their message better. So that tells me we have more work to do. We must continue to reach out — both across the aisle and to those with whom we disagree within our own party. If it means dragging these folks out of Columbus and into our county meetings, our churches, and our county fairs, we should do it. And we should reciprocate, if invited. Opening the lines of communication does not mean “selling out” and it’s not a step in the direction of compromising our core values. Right now, to many of our party leaders, conservatives are like a remote tribe they see on the National Geographic channel. They don’t know that we’re not like the loony extremists portrayed on Jon Stewart’s Daily Show. We’re hardworking Americans who love God, our families, and yes, our guns. We want to conserve — as conservatives are wont to do — the values that made our country and communities exceptional. We need to attach human faces and real families to those emails and Facebook messages they’re receiving and help them to understand the very real danger of a party split if the concerns of conservatives are not addressed. 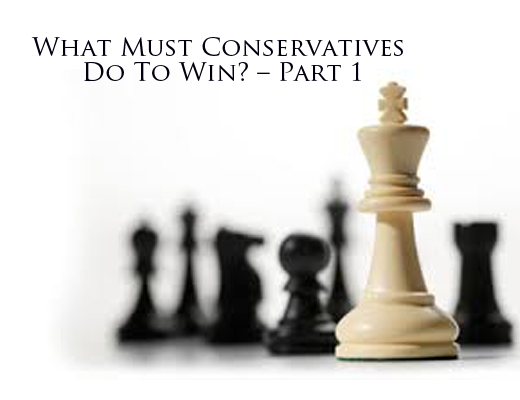 I would love to hear your ideas on what conservatives must do to win. The goal should be to promote our values by electing candidates who promote what we believe and who will enact legislation that does the same.